A number of people have asked about opportunities to purchase Freedom Stones, especially with Christmas approaching! Many of you know about hosting Freedom Stones Parties, but not everyone is able to host or attend those events. Thankfully, a woman from our community has provided an amazing opportunity for Freedom Stones to gain more public recognition and for any community member interested to come view and purchase the jewelry. On December 5th, from 10:00 a.m. to 2:00 p.m., Robert Frost Elementary's PTSA is hosting a Holiday Bazaar. 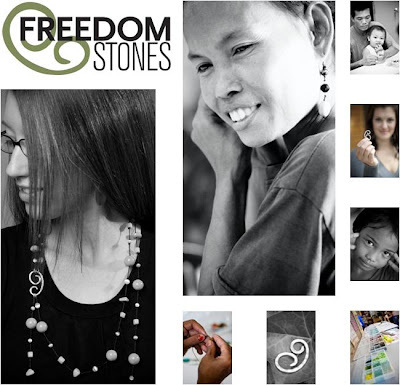 Freedom Stones will have a booth to sell the jewelry, and members of the Freedom Stones Team will be available to answer questions and share about the incredible work the organization does in the lives of those at-risk of human trafficking and sexual exploitation. What: Freedom Stones Jewelry for Sale! When: December 5, 2009 from 10:00 a.m. to 2:00 p.m.